I used to think that I would need a lid lift or blepharoplasty. As I approached my 40s, I could see my lids getting heavier. It was a family trait: I was heading down the same path as my mother and my older sister. As we age, our skin levels of collagen and elastin decline, making the skin looser and more wrinkly. After I opened Advanced Rejuvenation in 2007, I became a die hard fan of skin tightening treatments on my face and soon wondered whether the treatments could be applied to the delicate eye area. You can see how my eyelids look convex and the fullness makes my upper eyelid skin sit on my eyelashes. My eyelids no longer have that fullness. After 10 years, my lids appear better than when I was younger. The lines in my lower lids are only slightly deeper now than they were 10 years ago. I never worry any more that I’m going to need a lid lift. The treatment we are doing nowadays for skin tightening is microneedling. Our microneedling equipment today uses even finer needles than the system we introduced in 2014. Finer needles means less downtime. Microneedling involves making tiny punctures in the skin. These punctures turn on your healing mechanisms so your skin makes new collagen and new cells, rejuvenating the skin. 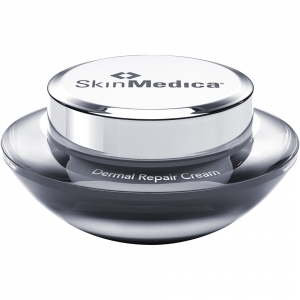 In addition to your healing mechanisms, we apply our growth factor serum over the microneedled area, turning the punctures into channels to get the growth factors deeper into the skin and boosting the amount of collagen and new cells that you make. Microneedling is safe around the eyes. We can only work on the skin that overlies bone so for the upper lid, we pull up on the brow to get as much of the eyelid skin as possible onto the bone, and similarly for the lower lid, we pull down on the cheek. We can generally treat quite a lot of the eyelids. However we cannot treat the eyelid over the eyeball. In addition to the skin tightening treatments, I use 2 products every morning in the eye area: TNS Eye Repair and GrenzCine Eye Cream. TNS Eye Repair contains growth factors so I’m stimulating a little more collagen formation every day to keep the skin firm. It contains the vitamins A, C and E for antioxidant protection, lightening and brightening and cell turnover. It is a good moisturizer for the delicate skin of the eyelids. And best of all, it contains a peptide that relaxes the fine muscles around the eyes, smoothing out wrinkles within 5 minutes of application. In my opinion, TNS Eye Repair is the best eye cream on the market. I added GrenzCine Eye Cream to my regimen about 1 year ago for 1 specific reason: you can’t apply most eye creams including TNS Eye Repair to the eyelids overlying the eyeball (this part of the eyelid is referred to as the mobile eyelid). Eye creams should be applied only the bony rim around the eye because the product creeps toward the lash line after application. If you apply it too close to the lash line, it will creep right into your eye, which really smarts (I know from personal experience 🙁 ). GrenzCine can be applied to the mobile eyelid. 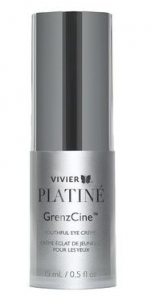 GrenzCine contains small peptides and vitamin C that stimulate the formation of collagen in the Grenz Zone of the skin, which is a collagen-rich layer between the dermis and epidermis. The Grenz Zone thins out as we age, making the skin more lax and translucent. Thickening the Grenz Zone makes the skin thicker, more opaque and firmer. I had noticed that my mobile eyelid was getting more reddish-brown, indicating translucency that was allowing the blood to show through more, and crepey. 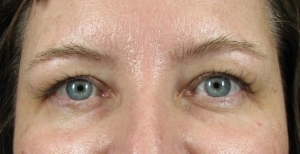 Since I started using GrenzCine, my eyelid has gotten lighter in colour, indicating more opacity, and firmer. I can’t tell you how thrilling it feels to be 10 years older and have my face keep getting better. If you would like to feel the same way I do, I encourage you to come and see us. We can work out a regimen for you that will keep you looking younger and better. Call 905-340-0401 for an appointment.